The Food and Agriculture Organization (FAO) celebrates the UN Decade of Family Farming, calling it an “extraordinary opportunity” that allows steady progress towards the Sustainable Development Goals. “Family farming is crucial to sustainable development in many aspects, including the eradication of rural poverty, hunger and all forms of malnutrition, as well as in preserving natural resources and biodiversity,” FAO Director-General Graziano da Silva says. The last factor is important as the UN food agency urges transformation in agriculture to fight climate change and ensure food security for an ever-growing population. According to FAO, by 2050 crop production needs to increase by 60 per cent globally and by almost 100 per cent in the developing nations to meet the burgeoning food demand of around nine billion people. Family farmers are important as they contribute immensely to food security and global poverty eradication. Globally, more than 90 per cent of farms are either operated by an individual or a family, producing about 80 per cent of the world’s food and occupying around 70-80 per cent of farm land. The 2016 State of the Food and Agriculture report talks about an “urgent need to support smallholders or family farmers in adapting to climate change”. “Smallholders face a broad range of barriers, such as limited access to markets, credit, extension advice, weather information, risk management tools and social protection,” Jakob Skoet, FAO economist, told Down To Earth earlier. Under such circumstances, extending all possible help to them is imperative. A lot of emphasis is being placed on smallholder farmers because they are vulnerable, resource-poor individuals with very weak coping mechanisms. The FAO Director-General added that the commitment of governments around the world, allocation of resources, development of cross-cutting public policies and social dialogue are the “basic ingredients” to successfully support family farming. In 2015, the FAO launched a digital platform where people could access valuable information, data and legislation on the contribution of family farmers worldwide. In 2009, the UN gave a call to scale up food production to feed the global population. 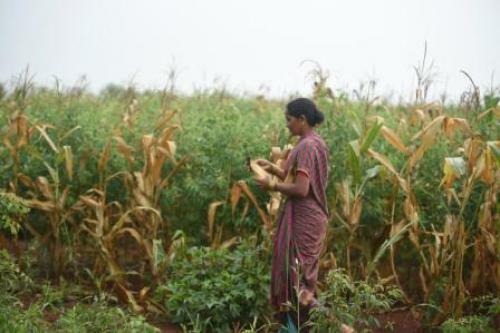 In such a scenario, Narsanna Koppula, the owner of Aranya farm in Telangana’s Pastapur village, says it is imperative to build resilience among small-scale farmers, improve soil health and encourage people to grow their own food. Family farmers depend predominantly on their own household labour. In India, traditionally farming has been family based and majority of the farmers are smallholders. Family farms maintain bio-diversity and hold the key to ending rural poverty cycles. I feel since 80% of small and marginal farmer having fragmented holding they need to facilitated to form groups which will enable them to develop farm level planning together with the technical inputs of field level functionaries and technically trained cadre to be raised by capacity building of rural youth(there is tremendous unemployment in rural areas who need to be utilized as resource person with proper training in Digitised agriculture to enable them to help the farmers).The planning and implementation in scientific means will help for sustained eco friendly agriculture to provide safe food and income to the farmers.The farmers need to be helped for proper processing,storage and marketing by the trained agri technician so that they get fair price.